IDW have just announced their next Star Trek comic series will be a five-part adaptation of Harlan Ellison's original screenplay for The City on the Edge of Forever. The series will be adapted by IDW writing regulars Scott and David Tipton, with painted artwork from J.K. Woodward; the same team that brought us the TNG/Doctor Who crossover last year. Each issue will feature covers by Juan Ortiz, creator of the TOS retro print series, who, based on the issue one cover (pictured), appears to be going for pulp fiction style. 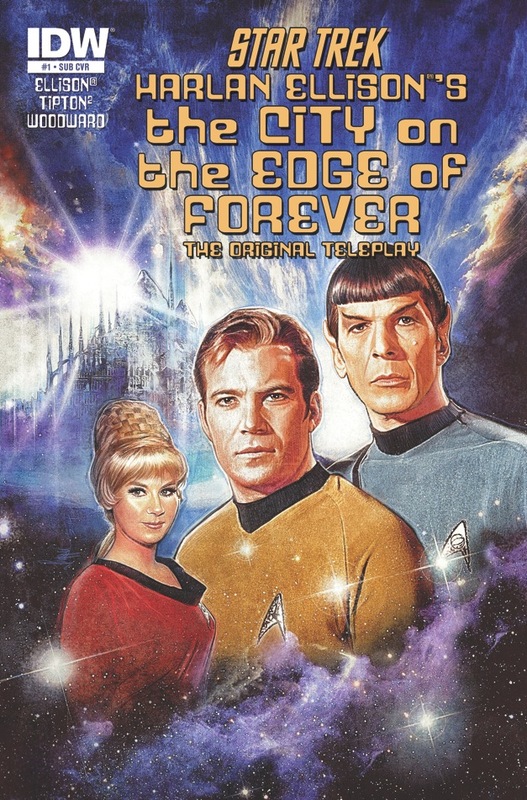 Star Trek: The Original Series episode “City on the Edge of Forever” is regarded by many (including a TV Guide poll of the “100 Best TV Episodes of All Time”) as the greatest Star Trek episode of all time, but there’s much more to the story than fans saw on TV. 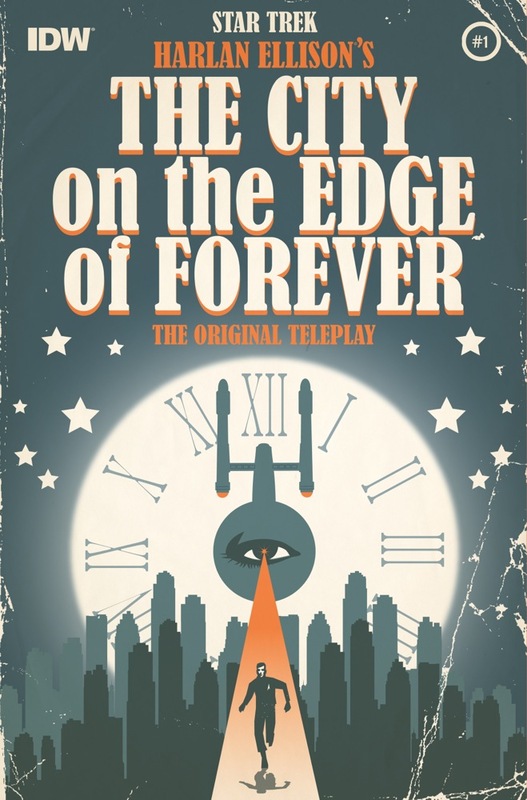 Harlan Ellison’s original teleplay for “City on the Edge of Forever” was modified before the episode was filmed, but now, at long last, fans will be able to enjoy his original teleplay in the form of an all-new miniseries coming from IDW in June: Star Trek: Harlan Ellison’s City on the Edge of Forever: The Original Teleplay. Ellison’s original teleplay won both the prestigious Hugo Award for Best Dramatic Presentation as well as the Writer’s Guild of America’s Award for Most Outstanding Teleplay. For decades, legions of fans have speculated about the episode’s history, but few people have read the original teleplay, which is very different from the televised version. This comic-book miniseries, produced under the guidance of Harlan Ellison himself, now offers fans everywhere the opportunity to see a classic Star Trek episode the way no one has seen it before. 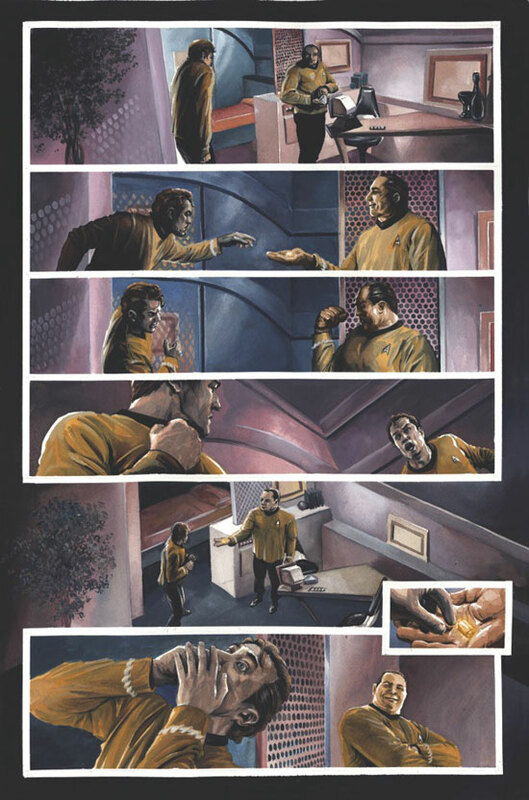 Adapting the teleplay for the comics series are writers Scott Tipton and David Tipton, no strangers to IDW’s Star Trek comic universe; interior art will be painted by J.K. Woodward, coming off the well-received Star Trek: TNG/Doctor Who maxi-series written by the Tipton brothers. 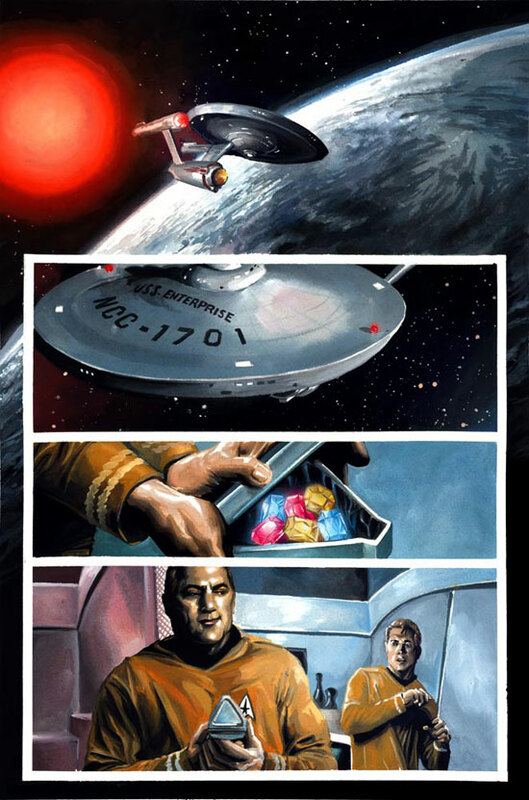 Each issue of the series will feature a special cover by artist Juan Ortiz, whose artistic interpretations of every episode of Star Trek: The Original Series were recently published in an oversize hardcover collection, Star Trek: The Art of Juan Ortiz. 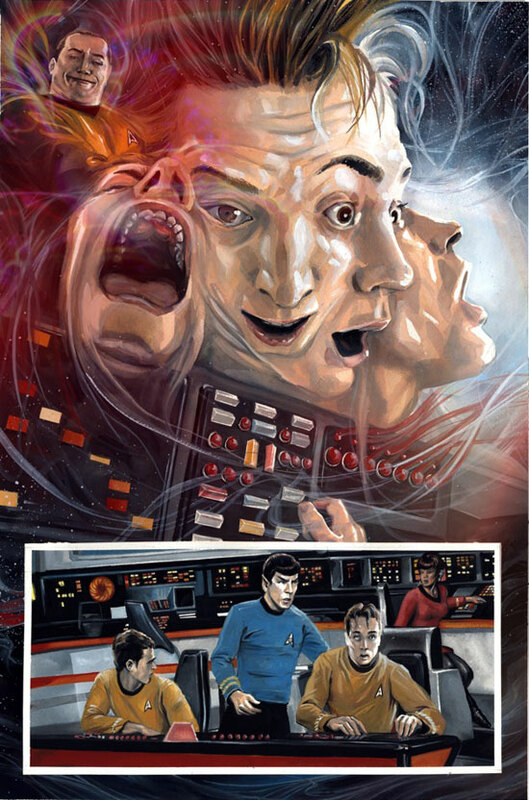 Variant covers will be provided by movie poster artist/Star Trek: Khan cover artist Paul Shipper. Star Trek’s “City on the Edge of Forever” originally aired on April 6, 1967, as the penultimate episode of Star Trek’s first season. The episode is, at its most basic, a poignant love story as well as a breathtaking trip through space and time, from the future all the way through 1930s America, as Kirk and Spock race to apprehend a renegade criminal and restore the order of the universe. 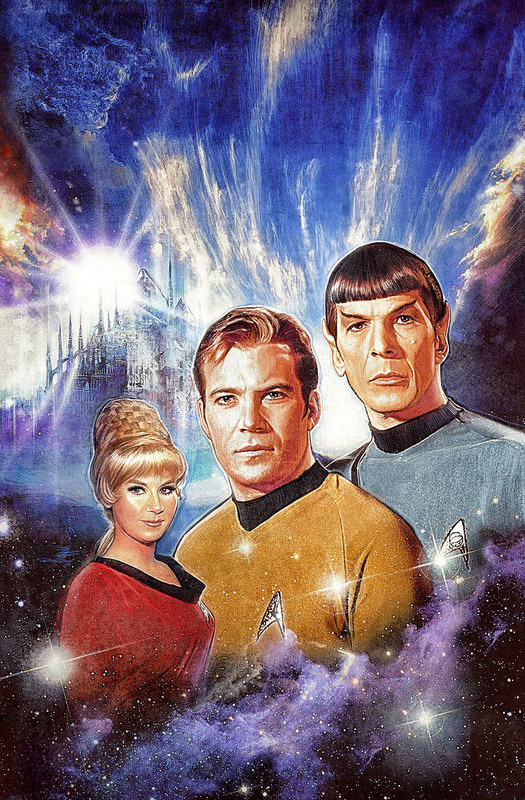 IGN awarded it the number-one spot in their list of the Top 10 Classic Star Trek Episodes. Further, TV Guide named the episode one of its 100 Most Memorable Moments in TV History. The first-ever comic-book adaptation of the teleplay as Harlan Ellison originally intended it is a true publishing event. I wonder if they will be basing the characters in this series off the likenesses of TOS or the new JJ movies...? Book bits: New covers and blurbs! Dammit Jim, I'm a doctor, not a cufflink!